Kelly’s Eye – a sort of redo of an old UK comics character that I know nothing about. I’m inclined to assume that McKenzie’s version had little in common with the original, although the one series that ran was noteworthy for being retro in tone, a kind of action noir type job. Rather fun, on the whole. Mean Arena – the 90s revamp with absolutely no connection to the original, and perhaps all the better for that. It suffered a little from having the main character be an ordinary man surrounded by more interesting weirdos. Chopper – that one story with Supersurf 13 that basically no one remembers. Including me. An episode each of Armoured Gideon and Maniac 5. His fair share of one-off twist-y tales. Reliably decent, at that. Pretty much the whole cast of Moon Runners were rather well-realized (bearing in mind the importance of Massimo Belardinelli’s input on the design, and co-writing duty from Steve Parkhouse). Having all his pieces in place from the get-go. Throwing a ‘normal’ person into very abnormal circumstances. Not taking anything too seriously. McKenzie joined 2000 AD as assistant editor just in time for the revamp of the comic with Prog 520, which saw a) a move from IPC to Robert Maxwell’s ‘Fleetway Editions’ and b) from printing the comic on old-school newsprint to somewhat smarter paper. with this Prog was a significant thing at the time. These two moves pretty much coincided with the death of weekly comics as a mass-market pocket-money treat for children, and a regular presence in British newsagents, towards their current status as niche, not always easy-to-find periodicals affordable only to adults. This was, of course, nothing to do with Alan McKenzie. 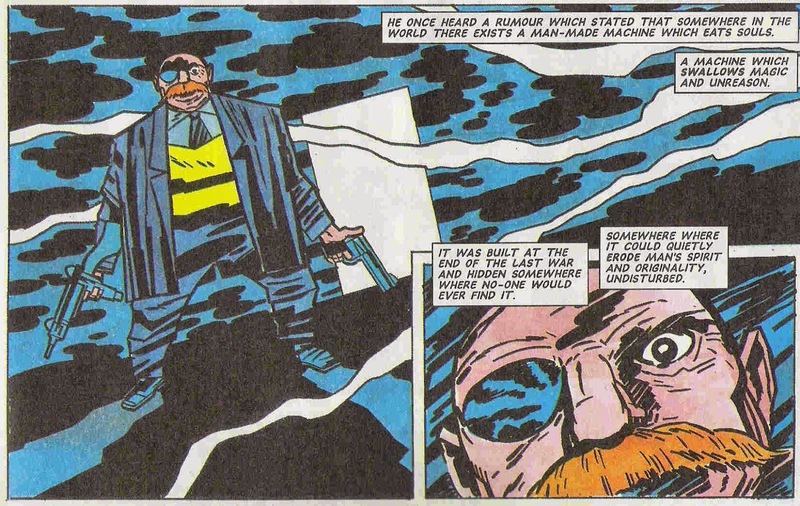 However, I think it is fair to include him as a part of the movement, beginning in the mid 1980s, that saw the media come to define comics in the 1980s as ‘not just for kids any more’. Both as writer and editor, I think, he helped push the comic towards more sophisticated storytelling and much more experimental art content. Other reasons include the suggestion that he wasn’t very good at the editing part of the job - although this charge has perhaps been levelled more explicitly at Alan’s senior, Richard Burton; more on him another time. There may be other reasons, too, I guess? It’s worth pointing out that McKenzie was one of the very few 2000 AD contributors who refused to be interviewed by David Bishop for his epic history of all things Tharg, Thrill-Power Overload. This perhaps means a slightly skewed view of his tenure is now part of recorded history. McKenzie is, however, perfectly forthcoming about his version of events on his own website, so it’s not a completely one-sided argument. It’s undeniably true that McKenzie contributed a lot of scripts during his time as both Tharg’s minion, and during a brief stint as Tharg himself (although there were, in the end, less than a year’s worth of Progs created under his sole charge). Only four all-new series joined the Prog line-up during McKenzie's brief session as Tharg-in-charge. Without knowing how things worked in the editorial offices at that time, it could simply be that someone had to come up with the goods at the last minute, to fill a page or 5 in the weekly Prog, and there may not have been anywhere else reliable to turn to get a solid script in place. I certainly don’t begrudge the idea that McKenzie, the editor, ended up feeling obliged to rewrite certain scripts (and likely not get paid for this) to get them up to a certain standard – I believe this emerges as ‘Sydney Falco’ writing some of the Friday stories originally penned by Michael Fleisher. 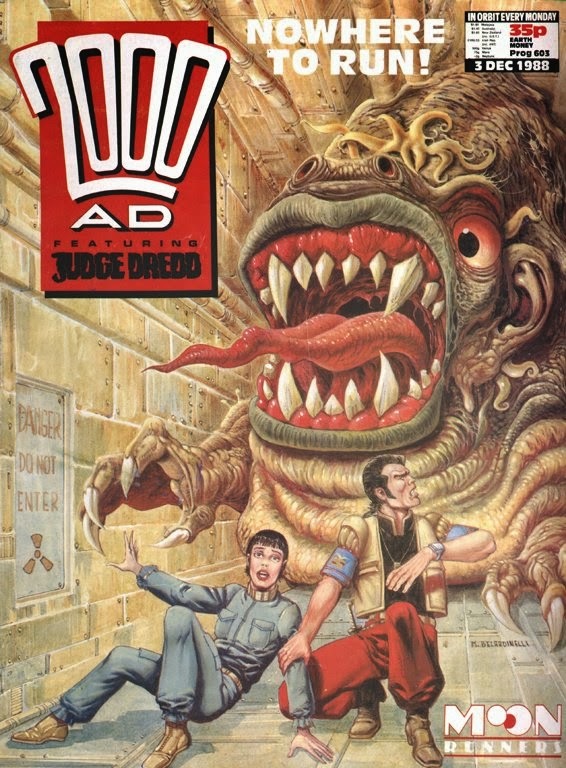 Second pseudonym ‘Sonny Steelgrave’ was McKenzie and fellow script droid John Tomlinson together writing Judge Dredd – arguably not terrifically well, but, in context, these tales are more true to Dredd than some other writers of the period. (I’ll not defend the Sugar Beat, which is too long and, intentionally or not, terrifyingly racist.) Again, given the need to keep Dredd goign and the lack of access to reliably good Dredd scripts at the time, maybe fair enough? Maybe. I’d also say that, from Tharg’s point of view, McKenzie was a safe pair of hands as a writer. The bulk of his stories were pretty good, including the notoriously tough to write Future Shocks. Certainly McKenzie’s hit rate with new series, overall, was overwhelmingly positive (to my eyes). I don’t know if his story/series proposals got special treatment (I mean, obviously they’ll have got the special treatment of actually being read, before and above random newbie submissions), but maybe they just were better than other stories Tharg was being sent? I was an avid 2000AD reader fan during McKenzie’s time as assistant editor. As such, I was one of, I assume many, readers who badly wanted to see more appearances of McKenzie’s creations, including especially Bradley and Luke Kirby, but also Universal Soldier and Brigand Doom. If the readers were demanding more from Alan the writer, I don’t think it’s cheating for Alan the deputy-editor to commission these scripts from himself. Comic stylings here are a pastiche of Rupert Bear. (yes, lawyer-types, I know that in real trials prosecution goes first, defence second). 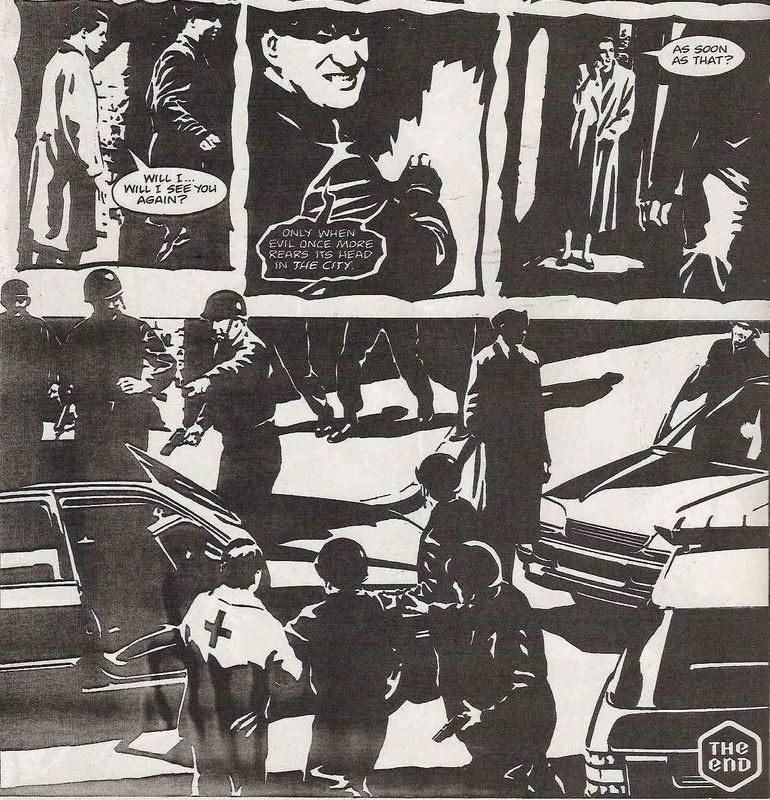 McKenzie was being paid, as editor, to fill the comic with top-end material. If that necessitated his own scripts, so be it. But it's not on to pay yourself for the scripts you need to fill your own comic. Is it? Right, that’s the elephant dealt with. Now we can move on to the nice bits! Indeed, while McKenzie probably wasn’t in a position to hand-pick Simpson for his strip, he had a pretty good go at getting some bold artists into the Prog. 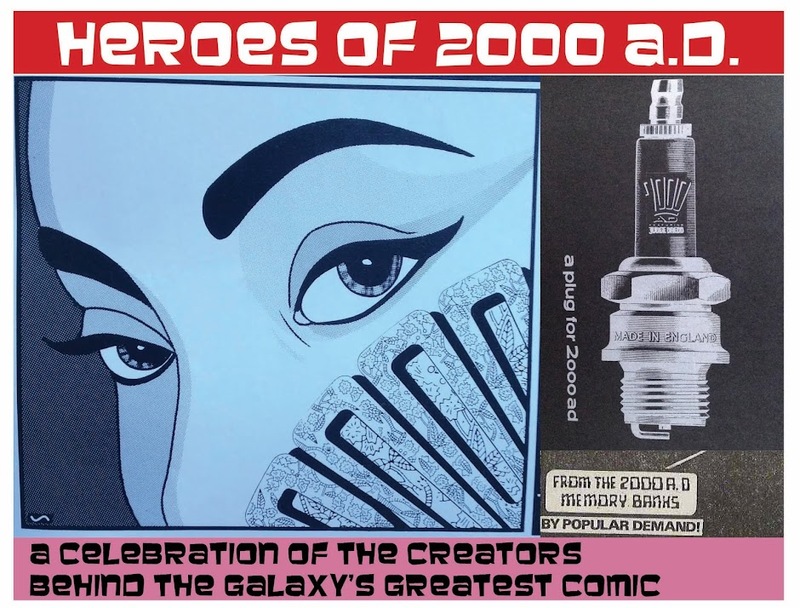 Ascribing credit for these things is very hard, but can we not thank McKenzie for his part in getting and keeping hold of young guns such as Simon Harrison, Dave D’Antiquis, Shaky Kane, Simon Coleby and Rian Hughes – as well as bringing in comics legend John Ridgway, and even the return of 2000 AD veteran Ron Smith, who’d not been a regular in the Prog for several years? 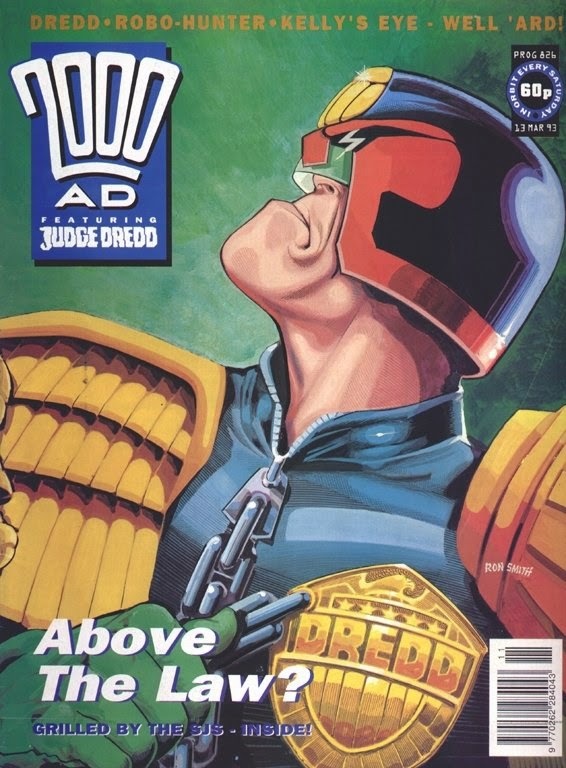 One more thing about McKenzie the editor – I’m inclined to blame/honour him for a change in style of 2000AD during the early 1990s. Was it not he, writing as ‘Roxilla’*, who filled the occasional page of the Prog with music reviews that generally championed dance music at a time when the UK was also embracing this relatively new genre? And is it not McKenzie’s own website that is all about the house music? In the future, six yeard-olds will like House music. Just how old was Bradley meant to be, anyway? I wasn’t really listening to any music at the time so it all went over my head (and frankly dance music is well out of my comfort zone still), but I noticed the general rave-based drift in the Prog, certainly different to what had gone before. Compare, for example, the then-look of Tharg himself (the Brett Ewins version), with his floppy Mohawk, pointy shades and such, to the previous Ezquerra version. A clear tonal shift. See also the dayglo colours used to advertise the Prog. David Bishop’s rough assessment of McKenzie’s writing talents (see Thrill Power Overload again) was that he was great at dreaming up new characters and stories that fit the 2000AD mould, but not always so great at plotting and scripting actual adventures. I can get behind this assessment, but I’m inclined to be more impressed by the talent needed to dream up working comics characters. 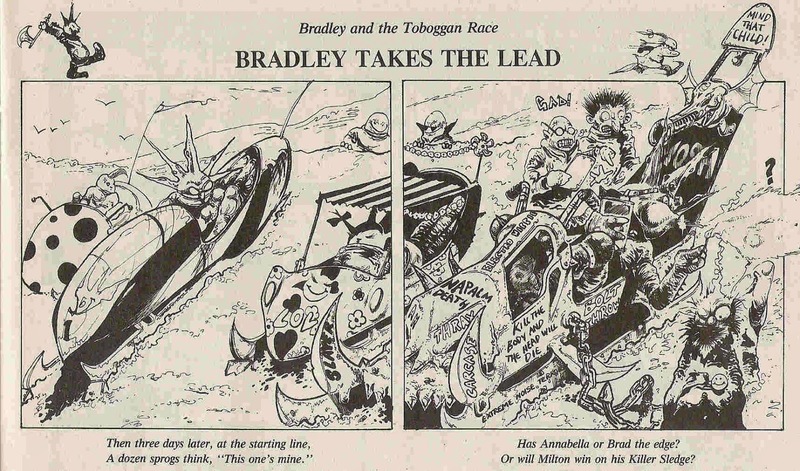 The ideal of British weekly comics always used to be: come up with characters and settings that suit endless one-off tales, occasional longer adventures, and, ultimately, a sense of continuity that never requires readers to have read every episode in order to stay abreast. Stalwarts would include Strontium Dog, Slaine and Sinister Dexter (just to pick some examples beginning with S). I think McKenzie managed this brief really rather well. Universal Soldier, as a character, is as versatile as Rogue Trooper, and potentially makes better use of the ‘evil, faceless corporation’ as villain than Friday-Rogue did to give the series overall some continuity. Who really pulled out some lovely work on the series, too. Brigand Doom is probably the closest McKenzie came to a pure formula strip. Each story involved: something corrupt in ‘the City’ being exposed. Brigand Doom meting out some form of ironic punishment. Investigator 9 being taunted by the Brigand. Investigator 9 almost, but not quite, working out who the Brigand is, and learning just how corrupt the City really is, and coming to sympathise with her nemesis a little bit more. Simple, effective, even elegant stuff, and massively elevated by a perfectly-matched artist in Dave D’Antiquis. Brigand Doom was all about bringing poetic justice to the sinful. There’s perhaps a sense that the more involved he became with the editorial side, the less good his written output was. Bradley’s move into retelling fairy tales was a neat showcase for artist Simon Harrison, but lost the comedy joys of the original stories. 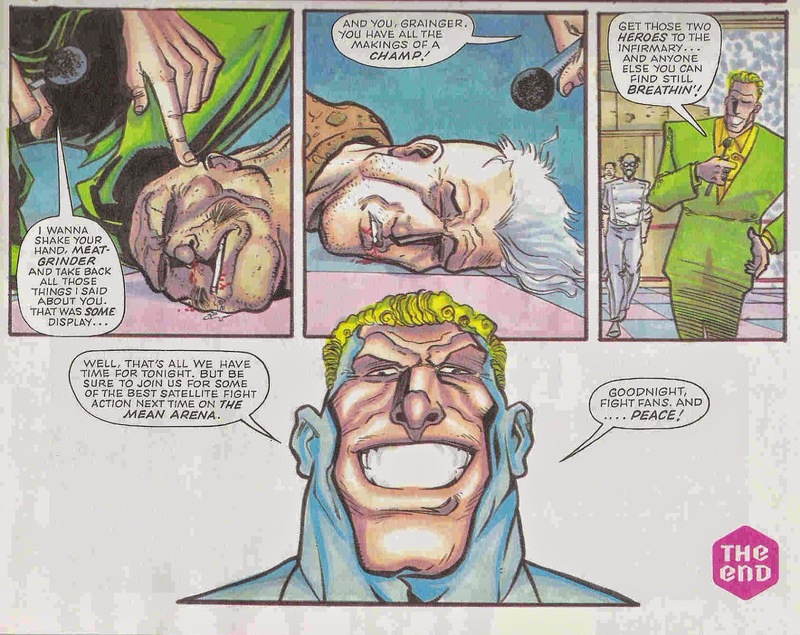 Mean Arena is maligned unfairly for being, basically, a children’s comic surrounded by the adult feel of contemporary strips by Grant Morrison and John Smith. Tharg was, I think, caught at the time without knowing whether to aim at 11 year-olds or 21 year-olds. (Modern wisdom would certainly suggest that Tharg shouldn’t try to aim at anyone, only at telling good stories). Nonetheless, Mean Arena, despite not doing much wrong, didn’t have much to say either. Soul Gun Warrior went completely the other way – less easy to read, but more fun to dwell upon. A noble failure? I had fun with it. And then, somewhat abruptly, he was gone, never to have a story printed by Tharg again. 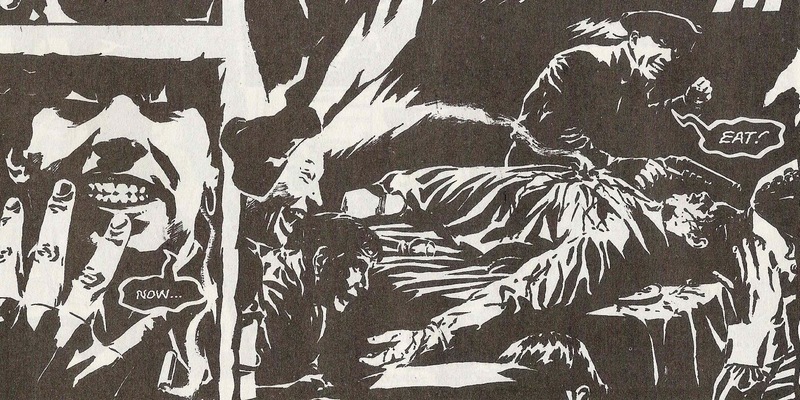 The best place to go is Alan's own website, which details his time working for 2000AD here. I'm not aware of any published interviews he's given about his time at 2000AD, but if anyone does, please chuck a link in the comments. And do remember that the aim of this Blog is to celebrate the good works of Tharg's droids - be courteous! *For those interested, the woman posing as Roxilla in the photo was apparently editorial PA Cyb-Aud, aka Audrey Wong. **I'd also like to put in here that Roxilla didn't come completely out of nowhere - John Brosnan's occasional film column ran from time to time first, and I always enjoyed the heck out of his knowledge of obscure B movies. And even this was pre-dated by D-Mil's movie round-up from days of extreme yore. 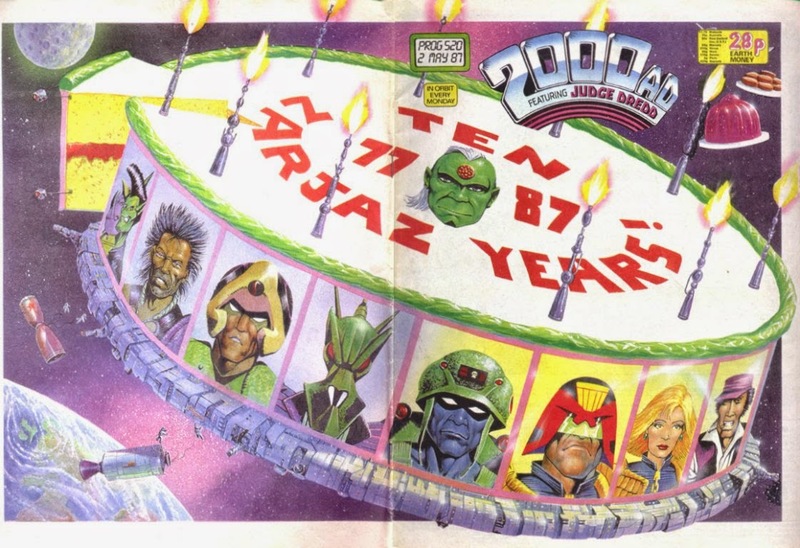 2000AD - more than just a comic! ***Actually, there is one. The first series of Universal Soldier is available in Tharg's Sci-Fi Thrillers. I've got to be generous if this project is going to work I reckon. Wait 'til you see how I find nice things to say about BLAIR 1 and the Space Girls!